These are the places where it’s just impossible to write anything objective about them. They’re just where we go, where we feel comfortable. We know those places have slipped into our world of ‘comfort places’ when we stop calling them by their name. If we’re going to Deep Blue Bar or talking about it with friends, it’s simply called ‘the bar.’ Everyone knows what we mean. If we talk about going to Cafe Park Teras, we’ll say, “Let’s go and see Tayfun.” Denizatı Restaurant is the same: “Let’s go and see Mehmet.” It doesn’t particularly matter whether Tayfun or Mehmet are there are not when we arrive, it’s just one of those things we say. And all of those places are in Fethiye – they’re all completely different from each other, but they’re all, for one reason or another, chill places for us. In Çalış, we have a few haunts that are completely different from each other, too, but they’re where we can kick back and relax. Bahane Bar is one of those places, and another one is, “Let’s go and see Carole.” That’s code for Güven’s Bar & Restaurant at the end of Çalış Beach. Yeah, ‘course we see Güven, too, but Carole’s the one we laugh, rant, chunter and put the world to rights with. We never look at the menu at Güven’s Bar. You can if you want – you can even look at it online on their website (see link below in the Useful Info section) – but we know what we want, if we do decide to eat when we go. Kuşbaşılı pide with extra chilli flakes on top and, if we’re really feeling naughty, a portion of chips between us. Homemade chips, too! As you can see in our little write-up for the photo, this was kind of a little treat before we started our new fitness regime…although I’m sure temptation will get the better of us at some point and nothing else will do but pide and chips. Yeah, there are free sunbeds and umbrellas on Güven’s beach area. Can honestly say, hand on heart, we only need the fingers of one hand to count how many times we’ve used them. We’re not sunbathers – but we are view admirers and, at all times of year – dramatic, moody, cloudy or clear – Çalış sunsets are always to be seen (and instagrammed – don’t think that’s a word – by us) from here. When we found out Türk Yıldızları would be wowing the crowds of Çalış Beach last October, there was no way we were going to miss it. And there wasn’t much thought about where we could stand to get the best vantage point, either. These are the events you want to share in the company of friends, so, on the day, after bad storms and following the Türk Yıldızları Facebook updates to see if they could even set off from their temporary base at Dalaman, we automatically chose, “Let’s go and see Carole.” All our photos (including this one, above) from the Türk Yıldızları display over Çalış Beach were taken from Güven’s Bar. As you can see from the dates, this Instagram photo is from 18 months ago, but we know it’s from some time back because of our little write up at the bottom. Güven’s Bar is open all year, so, in winter, you get views of Çalış Beach like this – beautiful and lonely and empty. Güven is a big Fethiyespor supporter – if you know the beach, you’ll know he’s had all the umbrellas painted dark blue and white; the colours of Fethiyespor. Oh, and all the metalwork, too. A couple of seasons ago, when Fethiyespor had made it to the dizzy heights of League 1, it meant some of their matches were shown on national TV. Well, if your team are playing away, you’ve gotta go somewhere to watch ‘the match’ haven’t you. A couple of times we went to Denizatı Restaurant (Mehmet’s a big Fethiyespor fan, too) and the rest of the time, where else but Güven’s Bar and a half time view like this. We’re back two years ago, now. Güven’s is the place where we can go and while away a few hours taking in one of our favourite sports (cricket). We usually listen to the cricket at home – but this was the Ashes. You’ve gotta celebrate with someone when you get wickets and rant at the telly when your favourite batsman is caught for no runs. And it’s good to do that with someone – we go and see Carole. Yeah, you’ve got to share those historic sporting moments with people you know are going to be just as excited as you are. When Fethiyespor were in the playoff final to get promotion to PTT 1. Lig for the first time in their history, there was nowhere else we were going to watch the match than Güven’s Bar. A few months after that when they drew Fenerbahçe in the Turkey Cup – and Fethiyespor beat Fenerbahçe 2-1, in Istanbul, at the world famous club’s home stadium, Şükrü Saraçoğlu Stadium – well, we couldn’t make the game in person so there was nowhere else but Güven’s Bar that we were going to witness that. Pide at half time, too, and celebrations afterwards. And this is just a random photo we must have taken one day when we first joined Instagram. Some time ago judging by the date on the photo. So, this is our Güven’s. We all get our own things from different bars, restaurants (and beaches). For some of our friends who come to Fethiye on holiday, we leave them to it in the daytime because Güven’s, for them, is a perfect, breezy sunbathing spot. That’s not our Güven’s. For others, it’s the kids’ club that operates from there. That’s not our Güven’s. And for others still, it’s the barbecue nights and special occasions. That’s not our Güven’s either. Our Güven’s is all the photos above and where we say, “Let’s go and see Carole.” That’s it. Güven’s Bar is at the far end of Çalış Beach next to the Çalış dolmuş station. Just in case you hadn’t realised, Güven’s Bar is run by husband and wife team, Güven and Carole. As well as free sunbeds and umbrellas, there is table and chair seating in the garden, as well as a shaded traditional nomadic tented area with lots of floor cushions. If you’ve got kids, there is a kids’ club that runs year round and kids on holiday are welcome to join in activities, too. ALL Güven’s Restaurant info (including menu, events, kids’ club info, etc) can be found on their excellent website. You can also keep up with all the goings on at Güven’s Bar & Restaurant via social media. Like their page on Facebook. 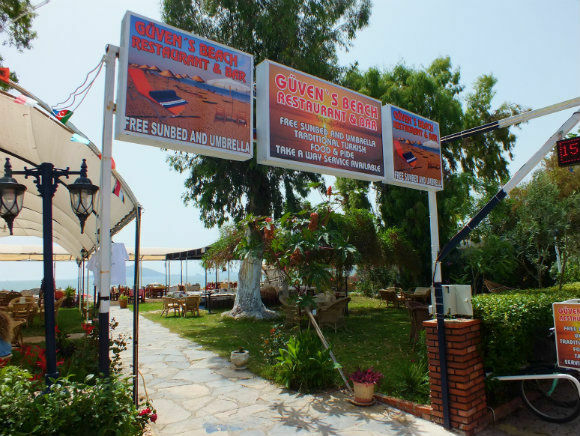 Follow them on Twitter; @guvensbar. And they’re also on Google +, too. Add them to your Google + circles. “not sunbathers, but view admirers” – yep, that’s me too. 🙂 This sounds like such a great place to relax and unwind. We get very fidgety when we’re sunbathing, Krista. 🙂 But yeah, Güven’s is a great place for taking in the views around Çalış Beach.